All transactions are safe and secure with a reliable history in online purchasing behind each of our associates. Buy the Johnny Drama t-shirts to own Entourage clothing and merchandise. Show your support for Vincent Chase's older brother, Johnny "Drama" Chase (Kevin Dillon), who the guys jokingly compare to Patrick Swayze's brother Don, also a struggling sibling actor. The comparisons end after Drama finds success starring on the television series Five Towns. Ari Gold even agrees to be his agent. 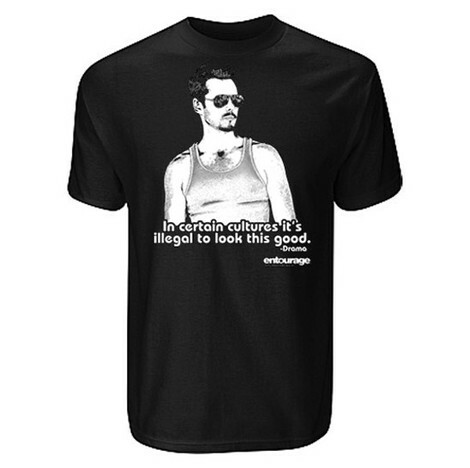 This Johnny Drama t-shirt displays a silhouette of the star, along with the quote, "In certain cultures it's illegal to look this good." Support the most underrated member of the crew. In addition to the Johnny Drama tees above, browse the Entourage Clothing Gallery for more apparel like men's and women's clothes, kids shirts or hoodies.